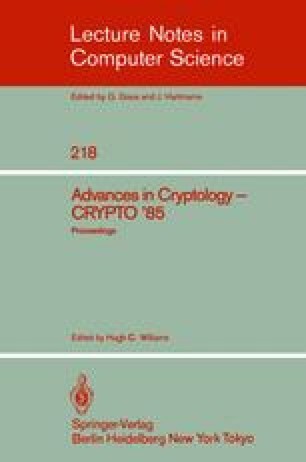 At Crypto’83, the present author showed that a transmitter and chosen receiver(s) -- by secretly exchanging some side information -- could pervert an authentication without secrecy channel to allow them to convert a portion of the authentication information to a hidden (covert) communications channel . It was also shown that under quite reasonable conditions even the detecticn of the existence of this Covert channel could be made as difficult as the underlying authentication algorithm was “cryptosecure”. In view of this open -- but indetectable -- existence, such a covert channel was called a “sublininal” channel. The examples constructed in  were more in the nature of existence proofs than of practical subliminal communications channels. At Eurocrypt’84 , however, it was shown how to use digital signature schemes as a way of realizing practical subliminal channels and, in particular, subliminal channels were devised using Ong and Schnorr’s quadratic approximation scheme , Ong, Schnorr and Shamir’s quadratic representation schemes  and Ong. Schnorr and Shamir’s cubic signature scheme  as Well as Carnal’s discrete logarithm-based digital signature scheme . Unfortunately, from the standpoint of providing a secure (and feasible) subliminal channel, all Of these digital signature schemes were cryptanalyzed , shortly after being proposed. At Crypto’84, a fourth variant to the earlier digital signature schemes of Ong, Schnorr and Shamir was presented by Schnorr  which was also quickly cryptanalyzed . At the 1985 IEEE Symposium on Security and Privacy, Okamoto and Shiraishi proposed yet another digital signature scheme based on quadratic inequalities  which had been designed to avoid the cryptanalytic weaknesses that hed flawed the schemes of Schnorr, et al. The cryptanalysis of this scheme by Erickell and DeLaurentis is reported elsewhere in these Proceedings . In view of the short-lived nature Of all of these schemes, it has become a high risk venture to propose subliminal channels based on digital signatures. The motivation for going so is that digital Signatures can be much easier to calculate and verify tnan full-fledged two-key ciphers. As a result, the benefits (of a successful implementation) far outweigh the risks of perhaps having an insecure digital sianature (or subliminal) channel slip by undetected. Based on the cumulative experience gained in cryptanalyzing the six digital signature schemes mentioned above, Brickell and DeLaurentis propose a new scheme in their paper that appears to avoid the weaknesses exploited in the earlier cryptanalyses. This work performed at Sandia National Laboratories supported by the U.S. Department of Energy under contract no. DE-AC04-76DP00789.